Sometime back, during one of my college classes, we were discussing the need to have something other than post-it notes to keep our places while knitting with charts. I’ve been mulling this little problem over in my mind ever since, constantly keeping an eye out for “just that perfect thing” that would be able to magically transform into a doable row marker. 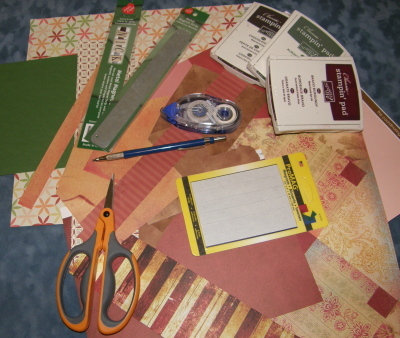 your favorite paper bits and bobs leftover from scrapbooking/card making. your favorite adhesive…needs to be strong! Step one: Trace around the metal strips with your pencil onto your decorative paper. Cut out. Step three: Carefully press the sticky edges of the paper down onto the edges of the metal strips with your thumbs. If this isn’t working to keep them down, then you might want to use your sandpaper, and sand the edges of your strips, so that the extra paper overlapping them is whisked away. Step four: On the back of the strip you intend for the back of your pattern, firmly apply the sticky side of two magnet strips end to end. Step five: I love objects that are thoroughly antiqued. One of the easiest ways to do this is to add a little ink to the edges of your projects. It just seems to make them more interesting and dimensional. See the right hand photo below for how to do this easily. Step six: Embellish! I added a sweet little old fashioned wooden bunny, and some ribbon to mine. I thought that was perfect, since I’m Angora! 😉 But anything you like will do the trick…or you can leave it just your pretty paper. What ever you decide, this is the part that really makes this your marker…all your personal touches! Hope you’ve enjoyed this little tutorial…happy chart reading! 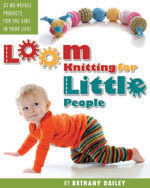 This entry was posted in Crafting, Free Loom Patterns, Knitting, Loom Knitting, Looming Patterns, New Projects, Tutorials. Bookmark the permalink. Oooh, that’s really pretty! Thanks for sharing it. Have a great day! Fabulous idea! You are so smart. This is a great idea. You really have a crafty mind and soul. I loved the tutorial. I will have to read it back and back and back in order to find here in Mexico all the materials, or at least adapt them with something else. The magnet strips I do not think I will find them and cannot import them because of customs. I will find something else, but the idea is great!!! 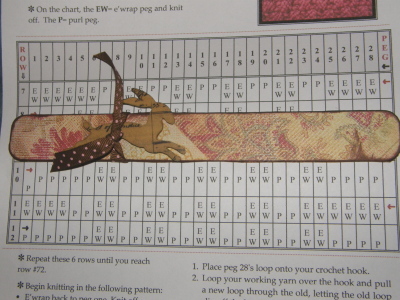 I have a set of these that I purchased years ago for cross stitching. Came with a metal board and long magnets to use. it’s really nice, but I haven’t used it in forever. I also think a metal board to attach this to would be helpful. You can take the ‘tin’ that comes in rolls at the home centers for roofing and cover a clip board, or any other type board. I would probably use spray on adhesive and then weight it down until it was dry. Where do you find the metal strips. I have found the magnet tape at my Joanne’s store but was wondering where you find the metal strips. I love this idea, what if you used the large tongue depressors? ?, There is also a paint you can purchase that can be painted on a wall (or clip board) that magnets can hook too. So, if I am reading this correctly, you only put magnets on ONE of the metal strips thereby being able to have them stick together through the paper….yes? Yes, I’m sure that’s correct. 🙂 Then the opposite metal strip serves to give something for the magnet strip to “stick” to. I still use mine…very handy! Just what I needed for my crazy complicated knitting patterns! Cool! 😀 I hope they still have those metal bars, as it’s been a while since this was written. But, if not, the idea is still sound and you should be able to find something suitable as a replacement. 😉 I love those knitting charts too!